Hello again! We had planned on posting some pictures from the zoo a few weeks back but ol' Mother Nature must have known the animals were going to be lame that day because she poured a bunch of rain on us that forced us to postpone our zoo trip. Ol' Mother Nature must have also known that we wanted to sit in traffic for hours and have our ceiling ruined right above our front door, because she went right from squashing the zoo trip to flooding most of the state and testing how water proof our roof is. Test results: 90%. Which is good because that means our roof got an 'A' but bad because that means 10% failed and started leaking. But that's the kind of teacher Mother Nature is. She throws a pop quiz on a Monday afternoon and even when most of your house doesn't leak, she still makes you file a claim with your insurance company. I think I'm mixing my metaphors now. Anyway, this last weekend we celebrated Angie's birthday with the Suskays up at the cabin. And on Saturday we went to the John C Campbell Folk School Fall Festival (or the JCCFSFF as I never referred to it even once). We had a lot of fun and saw tons of crafts and handmade whatnots. Patrick also got to experience a lot of firsts at the festival too. The highlights were definitely the pony ride, the alpacas and the drum circle. Patrick wasn't so sure about the pony at first but warmed up to it after a lap or two. I'm actually not even sure he realized he was on one until after the first lap. Patrick spent a lot of his time near them trying to figure out if they were a sheep, a horse, a big dog or something else entirely. Sadly, alpacas are really shy and tried to stay as far away from us as possible so we didn't get to touch them. We ended the festival with the drum circle. Angie recorded a few minutes of a Sesame Street the other week that has a "drum school" on it and Patrick has fallen in love with it. Every day he picks up my little hand drum, walks it to the middle of the room and points at the TV and asks for drum school. So we were pretty excited about him getting to see a drum circle in real life with a bunch of drums he could bang on. When we first arrived it was more of a drum triangle with just a few adults. But once we got closer they invited us into the group and then more kids started showing up. They had a few extra drums that Patrick got to bang on and some tambourines he could play too. He had a great time and it was a good way to end the day. Needless to say, he slept the whole way back to the cabin. In Baby Number 2 News, we'll find out the gender this Thursday! Which will be great because then we can finally stop calling the baby "Baby #2" and refer to it by its real name. We're really excited to find out if this will be a boy or a girl. We've been rearranging the house and playing room-function-musical-chairs as we turn the guest room into a nursery and the drum room into an office and our garage into a dump. Just for now though. That'll get cleaned up in a couple weeks. As usual, there are far too many pictures to work into the post so here are a few more from the weekend and then a slideshow. As always, if you'd rather just go straight to the picture gallery, you can click right here. There are some really cute ones of Patrick getting into the cupcakes, showing us the moon he found, dancing to the cloggers and more. Patrick taking Bo for a "walk"
Patrick's gotten very proud of his fork skills lately. He did this with every bite he took that meal. As always the pictures are too cute! Happy Happy Birthday Angela! Love ya kiddo! Bwahaha! 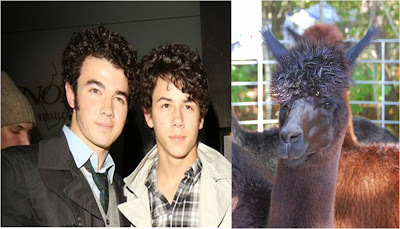 Love the llama/jonas brother reference. Happy Birthday Ang! These pictures are awesome. I cannot believe Patch is getting so big. Love you guys!